Raw macaroons seem to be a dime a dozen nowadays as the raw foods section in most grocery stores is usually stocked with them. One brand in particular, however, seems to be making its way into grocery and health food stores across the country at an expedited pace. Wonderfully Raw uses all-natural, organic, vegan, and gluten-free ingredients including raw cold-pressed coconut oil and unfiltered maple syrup to make its Coco-Roons. I've been amazed at how many times I've seen these colorful bags in grocery stores nationwide. 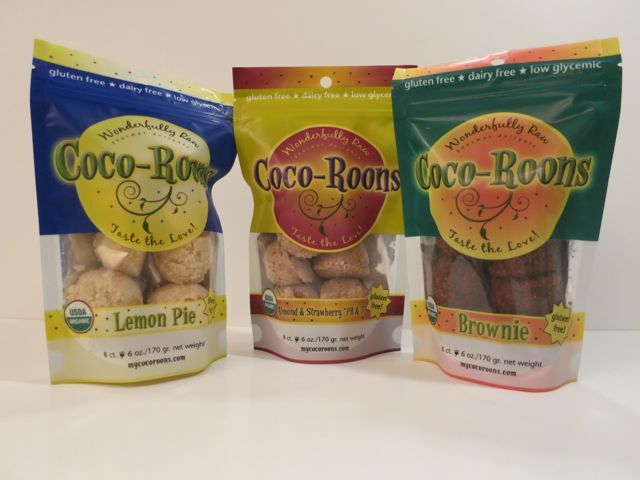 The woman behind this brand, Sequoia Cheney, wanted to create healthy snacks with a low gylcemic load as she had once been diagnosed with Type 2 diabetes. She knew she had to make some changes to her lifestyle and began by attending the Living Light Culinary School where she trained with some of the best raw food chefs in the business. 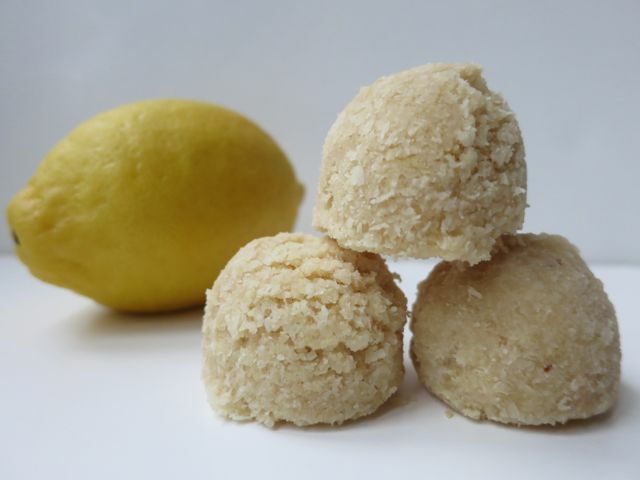 When she graduated, she teamed with her son, Eric Hara, a trained chef, to create these healthful macaroons. By changing her way of life, she was able to lower her blood sugar to normal levels and stop taking medication altogether. What I like most about these macaroons are the natural ingredients. 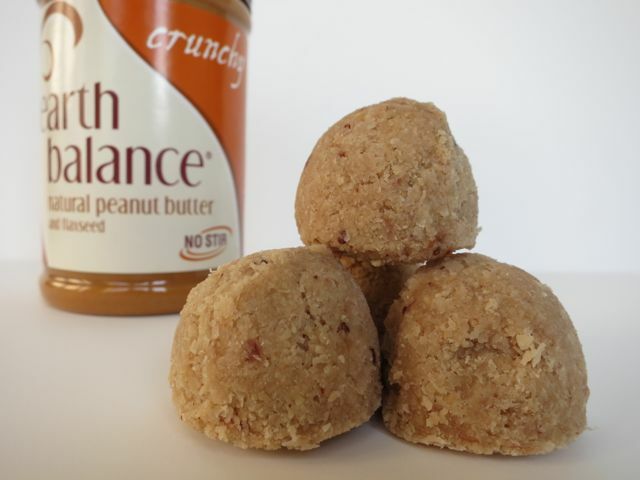 They are all made with raw unsweetened coconut, raw almond flour, unfiltered maple syrup, raw cold-pressed coconut oil, vanilla extract, and Himalayan crystal salt. These are all good-for-you ingredients. One thing that gives me pause though is why a raw product would use one non-raw ingredient. They indicate that the maple syrup is not raw on the package. I would think that if you are creating a raw product, you'd want to include only raw ingredients. 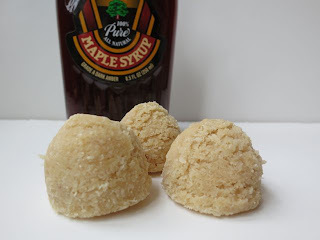 She does state that she uses maple syrup because it is an excellent source of manganese and zinc, which helps lower cholesterol and that the maple syrup they use is processed at lower temperatures than other manufacturers, but it still isn't raw. While I love maple syrup and know it is good for you, I just wonder why she didn't choose a raw sweetener instead. Anyway, on to the flavors! 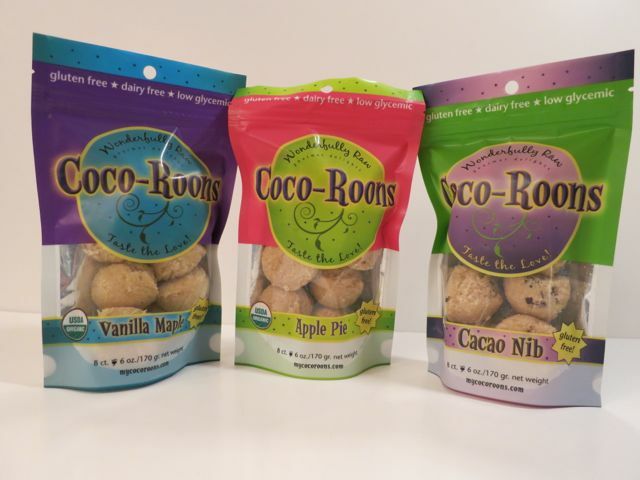 Coco-Roons come in six flavors. I will say that despite enjoying all of the flavors, I found most of them to be very dry. 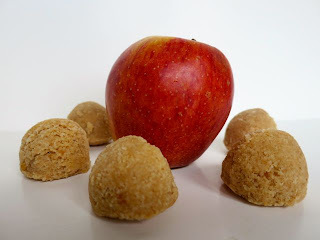 In the end, I felt that if they had been called, "cake bites," then I would have enjoyed them more as they are more cakey than they are macaroons. The one that was the least dry though was my favorite and that was the Almond & Strawberry "PB & J" made with raw almond butter and strawberries. The Lemon was also slightly moist and had a good subtle lemon flavor that paired well with the grittiness of the coconut. The Apple Pie flavor made with real chunks of apples and walnuts had great flavor as it was seasoned with cinnamon, nutmeg, allspice, clove, ginger, and chili powder. I also enjoyed the Vanilla Maple, which had subtle hints of vanilla in a maple syrup-sweetened macaroon. Surprisingly, my two least favorite flavors were the chocolate ones. The Brownie one was fine, but nowhere near as good as the chocolate ones put out by Hail Merry (which are also much more moist). The Cacao Nib flavor was my least favorite in the end. 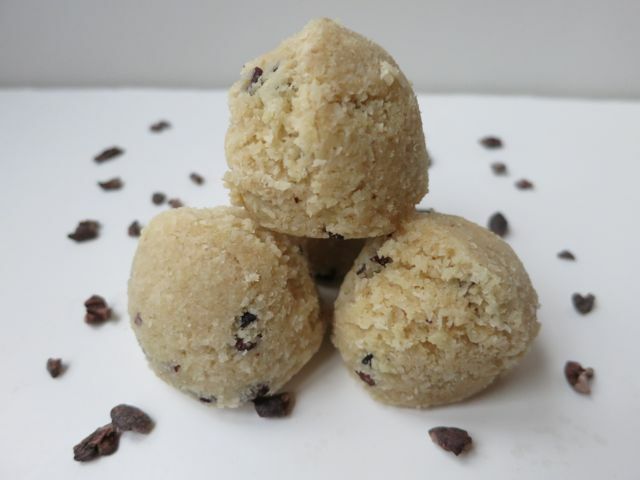 The flavors of the macaroon just didn't mesh well with the cacao nibs. So, in sum, I really enjoyed them when I stopped thinking of them as macaroons and started thinking of them as raw cake bites. From a health perspective, these are some healthful raw treats that are much better for you than cake or vegan ice cream. And I will say that they are larger than most commercially available macaroons on the market. To try them for yourself, you can order an 8-count bag for $8.99 here . And as Coco-Roons says, you will "taste the love!" Since these are pretty expensive I was wondering if anyone knows of a recipe for something like this.